Suzuki Swift Sport from 13,500 | What Car? 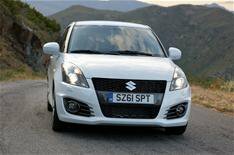 The new Suzuki Swift Sport will cost from 13,500 when it goes on sale next month. Based on the second-generation Suzuki Swift supermini, the new Swift Sport is powered by a 1.6-litre petrol engine that produces 134bhp and 118 lb ft of torque. Suzuki says the Swift Sport has a firmer suspension set-up as well as modified steering. Despite its perky hot-hatch aspirations, the Swift Sport still manages to do 44.1mpg and emit 147g/km of CO2. Inside, the Swift Sport comes with Bluetooth, an MP3 connection, and cruise and climate controls as standard. Other additions include 17-inch alloy wheels, metallic paint, a rear spoiler and rear privacy glass. Weve already driven the Swift Sport and we think it shines particularly on twisty country roads. The interior is much like those in other Swift models, but the Swift Sport provides great value for money at the lower end of the hot-hatch price range.